We were so lucky to be invited to LuigiKhans for a dinner date. It was exactly what we needed! There’s this advertisement near to my house that I think is absolute genius. It’s advertising a Punjabi restaurant and there’s a picture of a naan bread with 3 words written across it: ‘There’s naan better’. I love it! Ever since then, I’ve always wanted to visit LuigiKhans because surely a slogan that great must result in great food! So, when we went for dinner at LuigiKhans last Monday night, I had high expectations to enjoy myself. 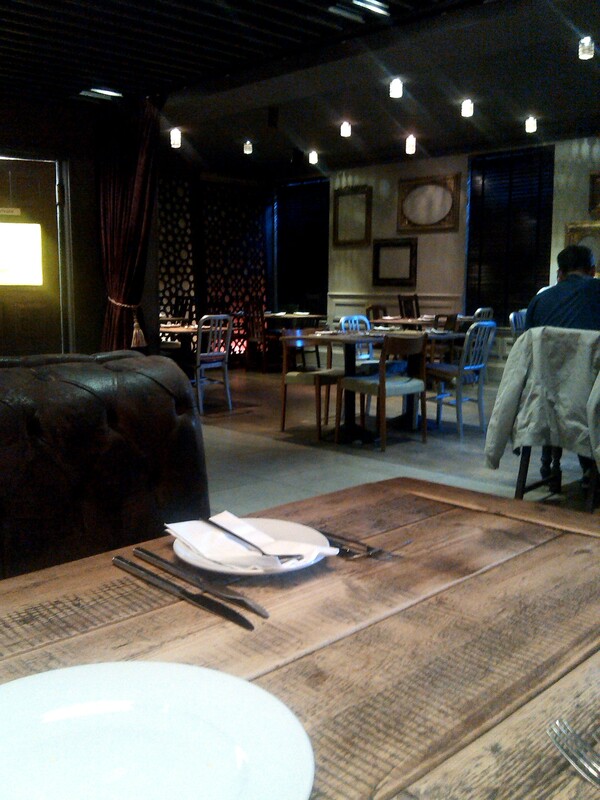 When we arrived, we were quickly taken to a lovely booth inside the restaurant. I immediately loved the decor. It was very glamourous with dark, sultry tones and thick wooden tables but it didn’t make you feel like you were out of your comfort zone. It was friendly and relaxed which I think was down to the fantastic staff. We ordered poppadoms & dip, a blackcurrent & lemonade and a jug of lime juice while we browsed at the menu. I am not really acquainted with Indian/Punjabi cuisine, but I was getting excited looking at all the different options on the menu! 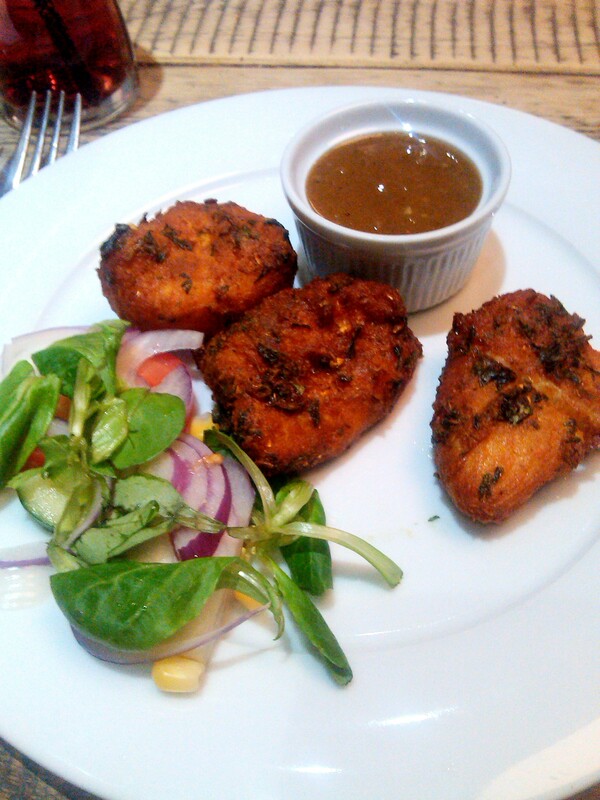 I ordered the Lahori Fried Fish (£4.25) for my starter (I’d seen it advertised on their Facebook page and thought it looked delicious! 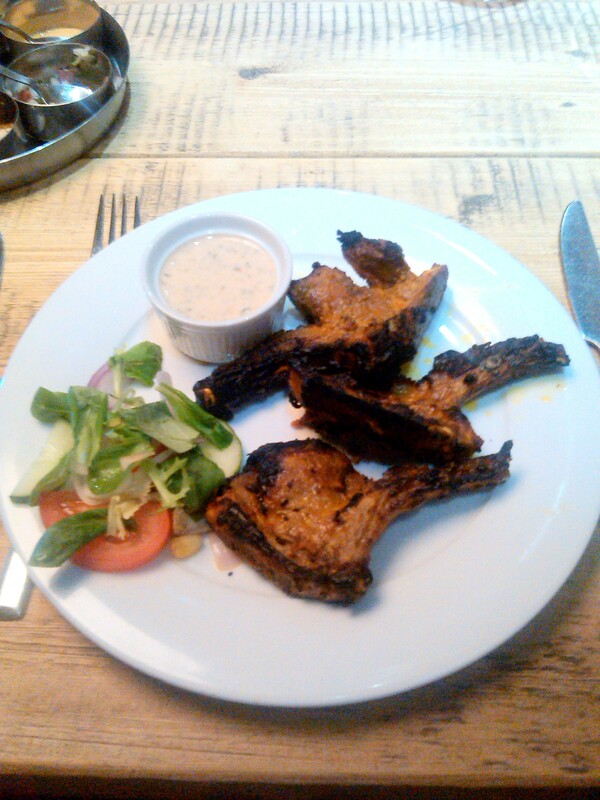 ), and MrJ ordered the Grilled Lamb Chops (£3.95). We loved our starters! My cod was cooked to absolute perfection and went really well with the mix of Asian spices it was fried in. MrJ couldn’t fault his lamb chops! 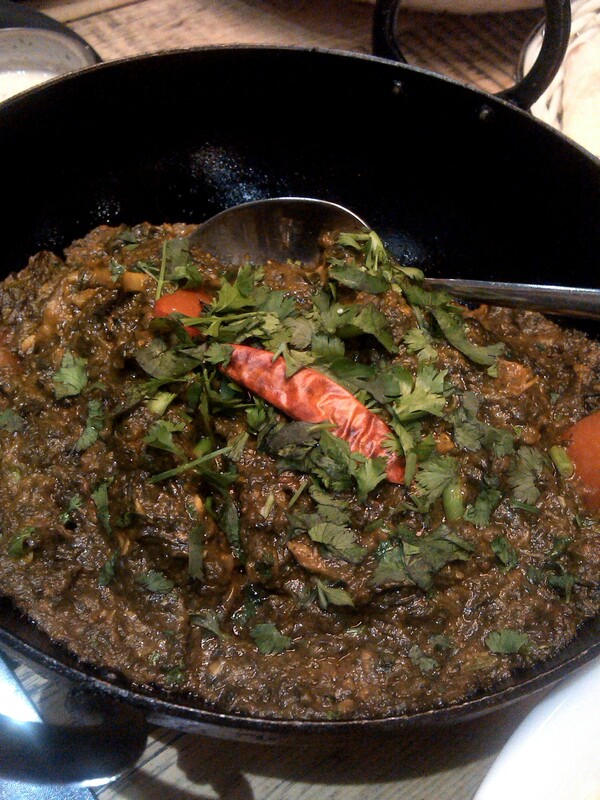 Moving on to mains, I ordered the Palak Goshat (£8.95) which is lamb cooked in fresh tomatoes, onion sauce with spinach puree and Asian spices. I was so impressed with myself for not just going for a chicken tikka masala or something! 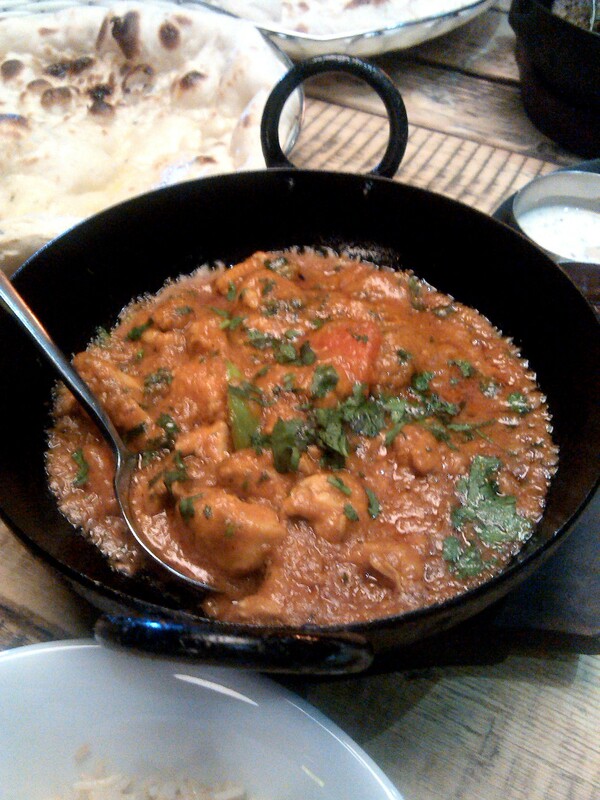 MrJ ordered the Chicken Karahi (£8.25) which is chicken cooked in tomato and yoghurt sauce with special Punjabi style Asian spice & garnished with fresh coriander, bullet chilli & ginger. We also ordered two naan breads (plain & garlic), and the waiter was kind enough to bring me a big bowl of yoghurt in case I couldn’t handle the spice! We had so much food. I’m glad we had such a big table to fit all our dishes on! My dish was absolutely delicious and I loved how succulent the lamb was. MrJ also really enjoyed his dish and we were so grateful when we were given the option to take away the remainder of our meal to enjoy the next day! I noticed that a lot of people in the restaurant took this option at the end of their meal, and it’s a great way of making the most of your meal; and I’m glad it’s encouraged by the members of staff as it’s great customer service. We stayed for ages in the restaurant, chatting and catching up with each other (our lives are like whirlwinds at the minute!) and casually dipping pieces of naan bread into our curries and sipping on lime juice (the most refreshing drink ever!). All in all, a lovely and delicious night. It definitely is Punjabi fine-dining and you can tell by the taste of the ingredients and the preparation of the food – as all the dishes and spices are prepared individually when the order is placed. We highly recommend this for a dinner date or glamorous dinner with friends. 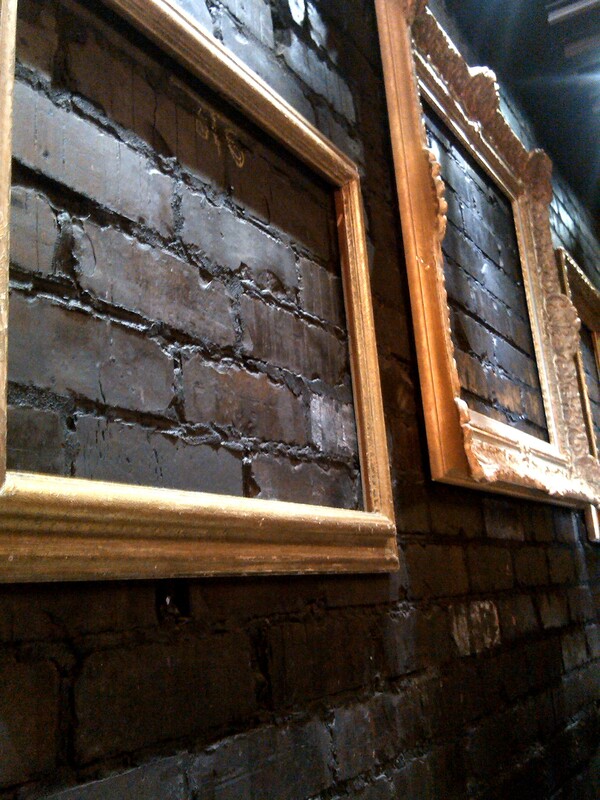 LuigiKhans can be found on Westgate Road, Newcastle-upon-Tyne.